Fiber One has done a solid job of shedding its “Old people love us!” stigma. Their granola-esque bars are genuinely good, and they now offer a lot of cereal that have a good balance of tasting good and being nutritious. 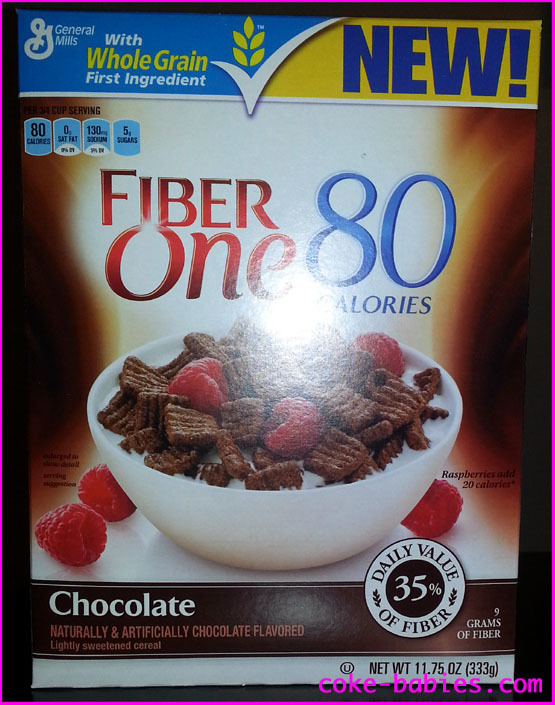 That said, it is still somewhat difficult to actually get excited about a new variety of Fiber One cereal. Although in fairness, making it chocolate does help. I enjoy the simplicity of Fiber One’s naming scheme. They don’t have a new, catchy or quirky name emblazoned at the top of the box. The name is “Fiber One”, you can find the flavor at the bottom. It’s not “Chocolate Delight”, or anything like that. It’s just, “Chocolate”. As far as nutrition goes, it seems to cover all the bases – low calorie, low sugar, high fiber. However, when a cereal leaves “old people” territory, and enters “sweetened flavor beloved by all” territory, simply being nutritious isn’t good enough. It now has to actually taste good. If you are planning on sticking to the 80 calories they mention on the box, do not add raspberries. As you can see, or maybe not – I may have shrunk the picture too much, the box mentions that “Raspberries add 20 calories.” I’m assuming they are including the ones that fell out of the bowl. I’m not eating those; they’re probably filthy now. So now you can assume the three left in the bowl add ten calories. I’ve seen plenty of boxes of cereal dress up the bowl with some extra fruit, but I don’t think I’ve ever actually seen the extra fruit accounted for, calorie-wise. Well done, Fiber One, on the honesty front. The back of the box reads like some cereal yearbook, with random quotes sprinkled around. It’s not interesting. One of these days, I will figure out how to use the flash without it landing right in the center of whatever it is I’m taking pictures of. I’m tempted to write a review for the Galaxy S3, although I’m not too sure my catchy headline of, “Takes terrible pictures of cereal boxes!” will deter too many potential buyers. The cereal pieces look sort of like bloated Golden Grahams, as if you left them out to die in the sun. Also, they are much darker, obviously. But I don’t actually know if skin can burn after it’s dead, so I didn’t know how much more I could tie into that “left to die in the sun” metaphor. Also, I don’t know how well a “left to die in the sun” metaphor goes over in a cereal review. The chocolate taste of the cereal is very good. 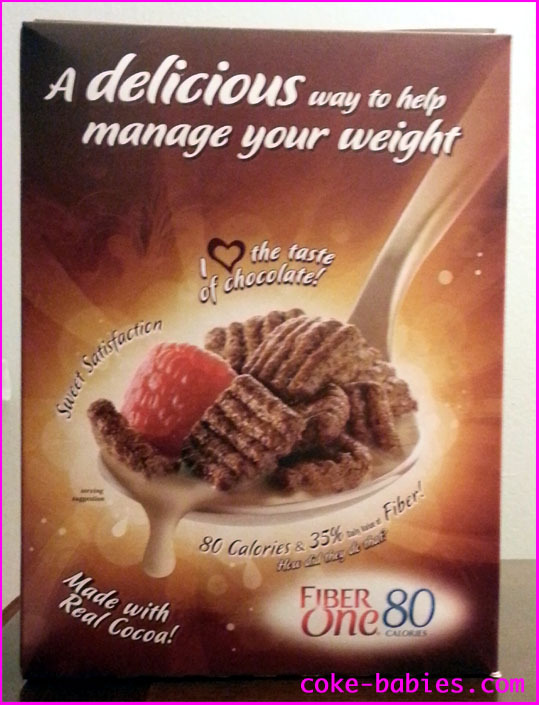 It is much less sweet than most other chocolate cereals, which isn’t surprising given the lower sugar. 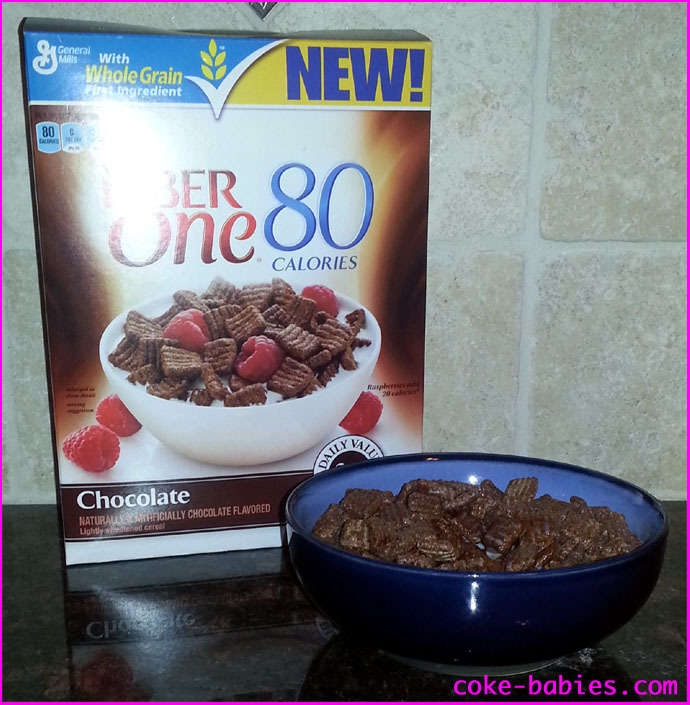 But unlike a lot of other cereals, this one actually comes close to actually tasting like real chocolate. Unfortunately, the cereal doesn’t permeate the milk very well, leaving you with a very diluted chocolate milk. I would recommend mixing this with Peanut Butter Toast Crunch, as you will then have one of the strongest PB & chocolate cereal mixes available. Since releasing approximately seven hundred flavor varieties in the past few years, it seems Mini Wheats have no more ideas on how to create a new Mini Wheat flavor. Okay yes, apparently they are meant to be hyphenated. I’m not going to go back and correct those, though. After running out of ideas for a new variety of Mini-Wheats, Kellogg’s apparently decided that the public still needed more varieties! 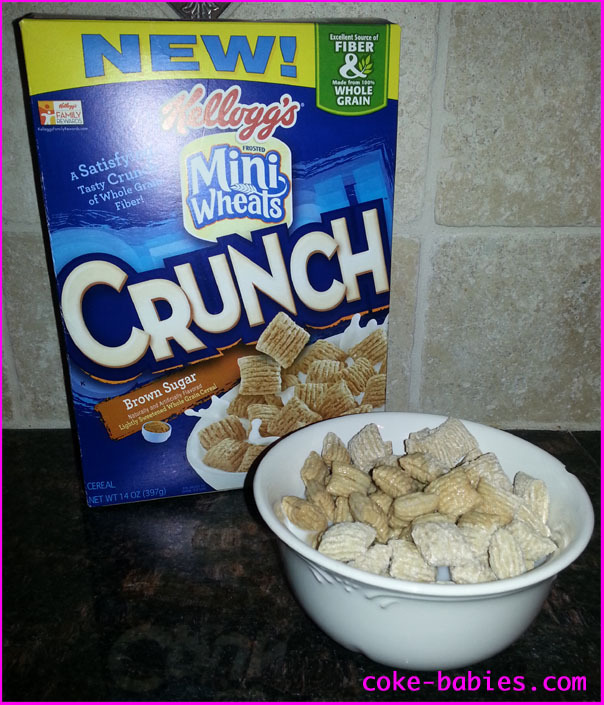 Frosted Mini-Wheats Crunch removes the thick layer of frosting (boooo! ), and gets rid of the “little bale of hay” shape. Which results in a cereal that looks like one that already exists. 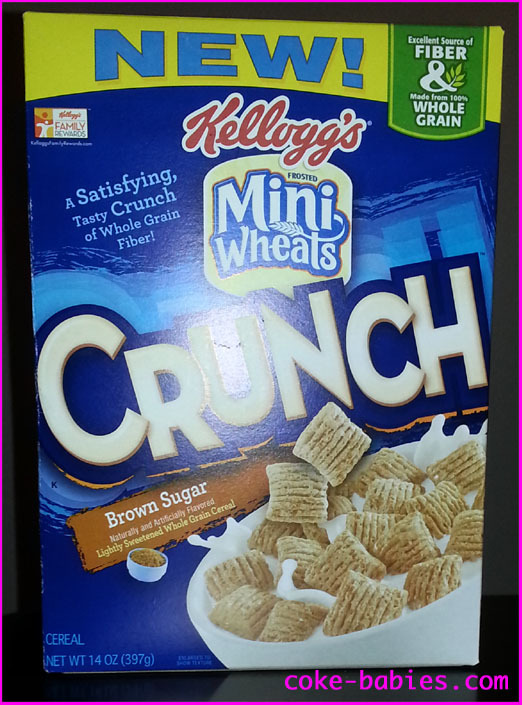 When I saw the box, the first thing I thought was that it looked identical to Quaker Oatmeal Squares, right down to the same “Brown Sugar” flavor. 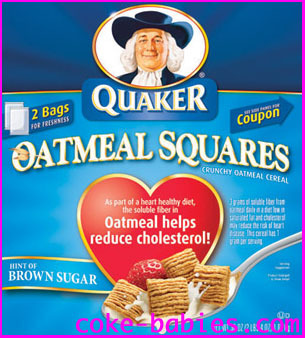 Then again, there are lots of cereals that seem similar, so maybe this would taste very different. The back of the box doesn’t portray the cereal in a very positive light. Going off the biology of the Frosted person, it seems that the Crunch body is mutated. 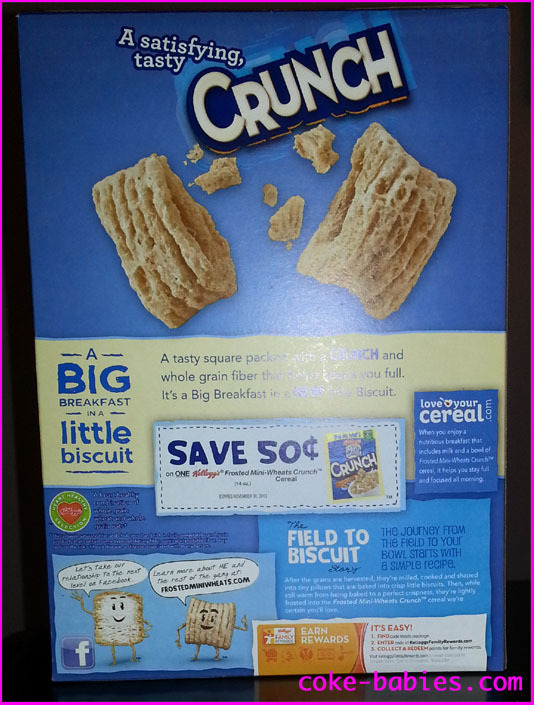 Since their grains are going in opposite directions, it is clear that something is dreadfully wrong with Crunch’s body. Regular Frosted guy asking you to “take our relationship to the next level on Facebook” is a very unsettling proposition. The cereal starts off with a somewhat off-putting sweetness. It’s not overly sweet, it’s just a very direct sweetness. You get more used to it as you go along, but it still lingers the entire time you’re eating. The texture is sort of strange as well, it’s got a bit of a crispy shell from the frosting, which leads into more crunch from the cereal itself. But at the same time, it’s not actually crunchy – just resistant. The milk you are left with just tastes like simple syrup. Overall, it’s definitely not a bad cereal. Just one that I have no real desire to buy again. I’ll stick to Quaker Oatmeal Squares, or the more normal Frosted Mini-Wheats.